This 18 day safari offers the chance to get 3 of the most highly prized trophies in Africa on one hunt. 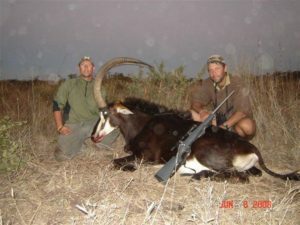 The hunter will take Cape Buffalo, Leopard and Sable in Matetsi- one of Zimbabwe’s premier hunting safari destinations. The hunter on this safari may take other plains game species on this hunt for trophy fee plus local taxes providing quota is available. Matetsi is located conveniently near Victoria Falls, Zimbabwe which is the pick up/drop off point. The hunter will be accompanied by Zimbabwean PH Gary Hopkins and his staff. If you are looking for an outstanding opportunity to take a free range large ivory elephant, you have found it. As quota for Matetsi is in high demand, we recommend booking this hunt as early as practicable to ensure your reservation.